I won't try to cover construction from A to Z. 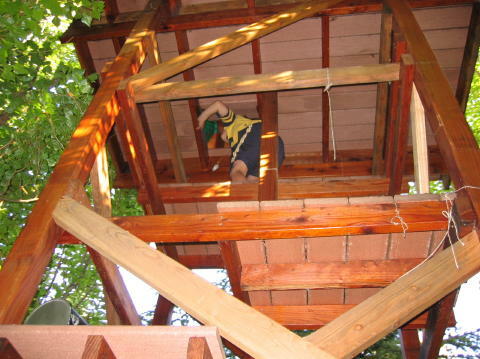 There are too many other good tutorials out on "how to build a treehouse" for me to try. I'd suggest folks who are going to take on a treehouse project read the books written by "professionals". The hardest part is getting the deck placed in the tree and those books will help you do that part of Tree house construction. " A warning: The whole idea of a tree-house raises safety issues. Probably the safest way to hand build a home playhouse is to stop before you start. However, you might do better than the kids will try to do on their own. Once committed to the dream of the more simple past, I'd especially browse the tree house links page, and onward references from there. Hopefully they might provide more tested thoughts on tree-house construction. I think I had a few ideas that I think worked for the smaller playhouses I was doing with the limited supervised family use the children's playhouses will see. 1) Lap light-weight plywood to achieve a nice look, at a low cost. I bought ¼ thick sheets of plywood(some places 3/8 for more rigidity) and ripped the 4' by 8' sheets of wood into 2' by 8 foot strips. I didn't start doing it that way, but once I moved over to the "lapped siding" look, it made construction an easier one man job. The taller sheet of siding pretty much need to be pre-assembled to the structural portions of the structure ant then lifted. It wasn't the lifting that was so hard, and doing the first coat of painting or sealing on the ground had some positives. The issue I found, while building within odd shaped spaces of multiple trees, was, that inorder to build structures that melt into the spaces between trees an branches, what you measure at the bottom might now work so well at the top. If you're sneaking a house into the maximum space between treess your walls really can't be quite so true. A box put where it doesn't belong would look stupid. A certain degree of asymmetry is charming, too much...well is less charming. We have "images" or myths in our minds...castle, cottage, fort, nest...you know what YOU Want, the tree's space might not! When you're up there and haven't done it more than once, you will probably get one of those "Homer Simpson" "doh" moments where you realize the dimensions you measured at the bottom might require more tree cutting than you imagined. In addition to preventing eventually sagging, the lighter wood sure helped dear old dad hold and drill em at the same time. Using 2" strips reduced waste around windows too compared to cutting out odd shaped windows from the 4' sheets. Remember though!, I would NEVER do this with a normal height structure where the thicker plywood does more than keep the weather out! Think strong, and if you aren't experienced hire someone who is to judge your own situation. 2) Remember to lap edge of walls over edge of decks. That's a no-brainer for folks accustomed to construction but I think many newbie's will forget that leading to wetter floors and quicker deterioration. 3) Use hardware. "hardware" being those metal bracket pieces. A few of these saved a lot of wood, and space inside the house. (I'm talking tiny structures here, if you are building a larger "home office" treehouse with adult hight walls and grown up sized rules you're going to think more according to true building codes than small playhouses) The metal brackets securely fasten walls to platform and roof, reducing chance of collapse of walls. By putting 2"x 4" s the flat way the appearance inside looked more like custom trim than structure. Being able to used the spared wood more laterally made up a good part or the thinness of the siding. Even with thicker exterior siding I'm not sure I'd want kids leaning against only the plywood fasteners from outside. "blocking" in the way of sills and lateral wainscoting made it a bit more rigid. 4) Before you design, look for close out sales where people have mis-ordered windows, and look at stuff you've got around your house, like old doors or brass fireplace guards like I used. You don't need to pay for those extras if you can size the house to fit what you've got. 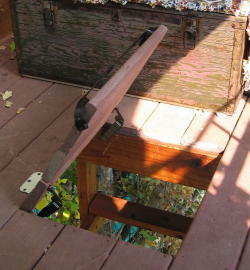 5) Think about slow close hinges on the trap door. There's no complete answer to prevent kids rough-housing from pinching themselves but I think these give an extra second or so and prevent the hardest "head bangs". 6) Think about using rising platforms for access instead of long ladders. 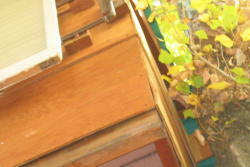 I noticed some of these in playhouses at fast food restaurants. I noticed a lot fewer kids falling on top of each other than there would have been with stairs or ladders.